When is 3.5 miles per gallon green technology? To the folks running Spokane’s trash system, it’s when the alternative gets 2.6 miles per gallon. 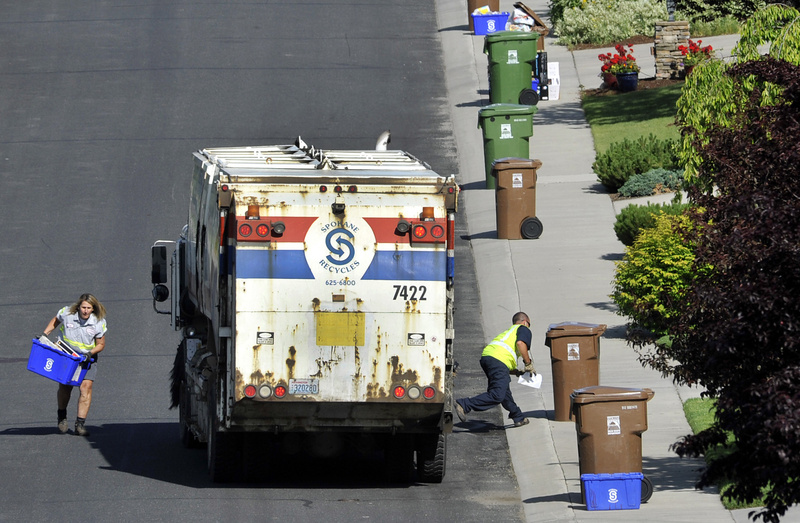 The Spokane City Council this week approved the purchase of 14 garbage trucks that will be used starting next year to collect recyclables in the city’s new commingled recycling system. Four of the new trucks are hybrids that are expected to get 30 percent better fuel efficiency, said Scott Windsor, Spokane’s solid waste director. “It doesn’t sound like much, but on a day-in, day-out basis, it makes a difference,” he said. Windsor said the city is scheduled to replace its garbage truck fleet in 2012 and 2013. If the hybrid recycling trucks perform well, the city will replace its 24 garbage trucks with hybrids. “We want to make sure they work as advertised,” Windsor said. The new recycling trucks are no different than garbage trucks and will replace trucks that have separate compartments for sorting recyclables curbside. In the new system, which will launch in fall 2012, recyclables will be sorted at a Waste Management facility. The city used nearly 440,000 gallons of diesel last year for its trash and recycling fleet, Windsor said. The hybrid trucks cost the city about $343,000 each. The regular trucks cost about $325,000 each. Both hybrids and non-hybrids are Peterbilt models, but the hybrid technology is from Eaton Corp., Windsor said. The city bought the trucks using reserves it saved from trash fees. Windsor said the city expects that the extra cost of the hybrids will be recouped in less than four years through reduced fuel use and the trucks’ longer brake lives. Paul Van Sickle, Spokane’s vehicle fleet analyst, said the recycling trucks will be the city’s first hybrid utility trucks. The street department has a Ford Escape hybrid used by a supervisor, and the city’s motor pool has two Toyota Priuses and one Honda Civic hybrid. The city also is wading into the electric vehicle market. It is buying a Nissan Leaf that is expected to arrive this month for its motor pool, and is hoping to buy a Chevrolet Volt later this year, Van Sickle said. “We’re sort of taking it one tentative step at a time because of the infrastructure needed to support these vehicles on a mass basis,” Van Sickle said. Though hybrids and electric cars generally cost more than traditional cars, Van Sickle said, the city’s vehicle budget has decreased in recent years. The city’s motor pool, which includes cars that can be checked out by different departments for city business use, has shrunk dramatically in the last few years from between 30 and 40 cars to three. With the purchase of the Leaf and Volt, the motor pool will be set at five. The city owns about 1,440 vehicles across all departments, Van Sickle said. That number is down by more than 100 since 2008. Van Sickle said that while the city is cautious about the costs and potential drawbacks of new technology, it will explore models that serve the city’s purposes and save fuel. “If something comes out between now and then that just rocks everybody’s world, we’ll be looking at that, too,” he said.